Our recent group to the Maya lands, in March of 2009, began in the way that most of our groups end . . . with great love, tears, joy and a deep sense of unity. I could not conceive of what would be our experience in the next 2 weeks as it was beyond my experience. On our first day, we loaded up the group into our Magic Maya tour bus, so we could head up to the birth place of the world, Lake Atitlan. As we were getting onto the bus, there was a big truck in the road and a few men were loading up a huge painting of the last supper. It really hit us as a profound message of things to come on our pilgrimage. The last supper was over . . . it was being loaded up and taken away. This age had ended. I remembered that this was the last thing that Jeshua did before his ascension. He said . . . "What I have done, you can do also . . . and greater things." I knew that the time had finally come for these greater things to arrive. I hoped that our group would in some way be a part of manifesting these greater things . . . I had no idea what this was going to mean to our group. About two weeks before our trip dates, I had a dream . . . OBE (out of body experience) . . . astral travel phenomenon . . . that changed my life (You can read about it here http://www.alunajoy.com/2009mar.html). The dream had left me feeling quite discombobulated. I did not really feel present anywhere. I was not totally here in this world, and not quite complete in the next. As our group took off for the Maya highlands, I noticed that most of us were in that challenging yet exciting spacey place of being between worlds. It was clear that we were heading into new territory regarding this sacred site pilgrimage. I could see that the entire world was entering new territory. It was uncomfortable, ungrounded, and we had a pervading sense of not being in control. As days past, and we had our ceremonies with Don Rigoberto at Lake Atitlan (see the video at http://www.youtube.com/feelthelove2012), the discombobulated feeling was persistent. After Lake Atitlan, we traveled on to Tikal. We had our ceremonies and explorations all the while still feeling like we were between worlds. We were cleansed in a torrential downpour while sitting atop temple 4. The water was coming down so hard that the temple became a water fall, and Temples 1 and 2, jutting out of the jungle canopy out in front of us, disappeared in the rain. I felt like in that moment that I was touching the entire site at once. It was exhilarating, and we were soaked. While in Tikal, I was called to an area of the site (group G) that has a doorway that goes from one side to the other. Only one other place in the site does this. The energy from one side to the other is quite different, and I have always felt that these could be doorways between worlds. Because we were already feeling like we were between worlds . . . we might as well push the envelope, and go to the area that feels the same way and see what the Star Elders have to say about all this. This is the Star Elders message . . . I edited it a bit to make it clear to the reader, yet I wanted to leave it as close I could to the original message so that the energy would be retained. The Star Elders say if you, the reader, imagine that you were there with us, that you will get the download and the energy shifts as we did on that day. The Star Elders wanted us to come to this place today (the double doorway between realities), because it is a doorway that goes from one place to another . . . and they say that this is where we (humanity) are right now . . . we are in the place in between. They wanted to work with our energy today to help us re-focus and get clear about what we need to let go of and also what needs to be birthed inside of us. We won't know this with our minds, but our body will remember this. So if it is OK with you, the Star Elders would like to work with each and every one of you . . . and if it is OK, inside of you, just give your mental permission. And if you don't like it, you just say "no". They won't be offended; nor will I. What they want to do now is to help you identify the places inside yourself that is based in duality. The Star Elders are going to help you let go of this duality inside of you. They are building big dumpsters in each one of you. The Star Elders have a very bad sense of humor sometimes . . . it looks like a big trash can. The Star Elders are going to start putting the things that we identify with that belong to the world of duality, and they are going to start putting these things in the garbage can. Some of these things you don't even realize are dualistic. With each of these things that they put in the dumpster, they are going to ask your permission of your higher self first . . . OK. So nothing will go in the dumpster until you are ready to let it go. They won't do anything that makes you uncomfortable or what you are not ready to do. If you are ready to start bridging the gap between this world and the next . . . build the bridge within you between the world that we are coming from, and the world that we are going into, then they will help you with this now. The Star Elders will help you at any level that you are ready to handle. Another thing the Star Elders say about this time which we are in is that it doesn't have anything specifically to do with this group, but has everything to do with the entire world. We are all in the time in between. At this time, it is easy to lose our focus. The Star Elders want to help us re-focus. They want to help us re-focus like we were looking through binoculars. They are showing me a big, giant pair of binoculars. These binoculars allow us to see what is out ahead of us (the future), and they want to help us focus positively on this future. They use binoculars, because what you see out in front of you looks closer than the place you are in. You are looking further ahead of you than where you actually are. The Star Elders say that all of our binoculars are a little out of focus, and they are going to help us re-focus this so we can see further. This is what I'm seeing them doing. They have been out of focus because of fear and our habit of not listening to our hearts. OK . . .
By the way, your dumpster, where you are throwing all your duality, is behind you. So every time you take a step forward in your life with the binoculars, that dumpster becomes further and further away from you. With each thing based in duality that you toss in there, and you take another step forward, the dumpster becomes something that is in your ancient past. You might not even remember it is there. OK, now I am seeing a beam of light coming from the cosmos, and it is coming down through our crown chakras all the way down through our bodies. It is re-aligning us. It looks like a double helix pattern like our DNA. It is putting a beam of light through us that ties the dimensions back together within us. I see another spiral of light inside of us now, and this beam of light is going down the center of this spiral. The spiral is the energy which we are in. It is that discombobulated, changing, morphing, spiraling energy that we have all been feeling. We feel not solid on our feet . . . a little wobbly, and they are going to straighten this out. If this is OK with you, they will do this now. I see the spiral going all the way down to the core of the Earth, and it looks like it goes all the way out to the Great Central Sun. I think that this centering beam might have to do with the constant that I saw in my dream (read about the dream here http://www.alunajoy.com/2009mar.html). For those of you that didn't read about my dream, a constant is something that is inside of you that is the same in all the dimensions. So when you go to another dimension, you find that one thing in you that is your constant, and that is how you anchor in that dimension. So for some people it might be a sound, it might be a color, it might be an idea or a truth. It could be a feeling . . . it could be anything. So I think that what they are doing is helping you anchor your constant in those other dimensions. So when you shift over, you will find that place that you know is where you can put your feet down. Does that make sense? Now the central beam of light looks like it is growing little tiny filaments inside of you, and it is going to wrap you in a cloth filled with light. It feels like it is rebuilding our bodies. It is very transparent, and it is fiber-like and has a very gentle, healing feeling too. The Star Elders reminded me to tell you that they know that each and every one of you came here (Earth), because you were ready to make a shift in yourself and you intended to do that. They recognize your permission to help with that crossing over from one dimension to the other. OK . . . back to the light cloth . . . Now this cloth that is made out of these little fibers that is coming from the core (central) light that is going through our bodies . . . they are putting a frequency in this cloth. I don't know how to explain it, but it looks like a frequency . . . almost an audible frequency that has a subtle little vibration to it that you might even feel physically. The Star Elders say that what this does . . . the vibration of it . . . breaks away . . . kind of like sonic energy . . . it is going to knock out the duality inside of you. It is going to clear out the things that can't go to the next world. The Star Elders say that if we took it with us, we would just recreate this world all over again. The memory of our bodies and our minds always wants to recreate the place that is comfortable . . . that is familiar. So there are a lot of things that are familiar to us by having lived in this world that we don't want to recreate in the next world. It wouldn't be that we would recreate this because we were unconscious or dark or evil people. We would do it just because it felt familiar. They say that there is a few in this group (and those reading) that will be story tellers that will remember what we let go of today, and in the days to come. You will tell the stories as a wise one that tells stories of the past age and remind the people in the new world of how lucky we are to be in the new world. You will remind them that they left a world that was heavy, corrupt, and yet so beautiful. These story tellers will go through the shift with their eyes open. It is not a comfortable journey. It will feel very confusing, but they are reminding me that the confusion will only last a short time. Just breathe and know that it will be OK. Some of you would rather be more comfortable, and you will go to sleep just a little bit and wake up on the other side. And that is OK. There is no right or wrong way to do this. No better or lesser way. Someone in the group asks: "Is that what could be the idea of the 3 dark nights? Aluna: I am thinking so. In my dream, I woke up in the dark. But I am not sure. No one told me that this was the three days of darkness. I just woke up in the dark and watched a new sun rise in a new world. I am aware of the many prophesies floating around out there, but I can't say for sure if they are true, or not true. I don't think anyone knows that yet. So this sonic scrubbing of duality continues on in our DNA now. Because we were born here . . . we were raised here . . . the sun goes up, the sun goes down… there is black and white… right and wrong, etc…. The only way we understand our world is by comparing it to something else. And when we do compare, that is duality. The only way we can understand white is white is because we have black. We understand red and green because they are so opposite. In the new world, we won't have those opposites. So when we move through to the next side, those things that have given us our anchoring, or that we have identified with, they will go away. The other thing that will happen when we make the shift is that we will live more in the present moment. Oddly enough this group is actually acting from this place right now . . . even though we seem unfocused, everyone is staying present right where they are at. The Star Elders say that one of the tricks that we need to learn now while living in the present moment is to keep moving. This group has entered the one of the first places (Tikal) that is emanating the frequency of oneness and present moment. Because we are starting to move into living in the present moment, we are getting stuck. Because we feel present, we also stay still. So we don't move . . . we stay in the hotel, we stay here, we stay there. We are not moving. And they say the trick when we move through to the next dimension, and the present moment becomes more of who we are, we have to remember to keep moving. We may not know where we are going or what is going to show up when we get there, because that would be out of present moment. But we need to keep moving. And the moving is going to help us anchor the new world inside of us. If we stand still, it won't work. Now I understand why I had to arrange this trip so that we ended up in the ocean. We are going to go to the ocean to swim and swim. The Maya oceans are a place of super clarity and this water will be moving; yet there is a stillness and a oneness when we snorkel in that water. It is so amazing. It is magic Mayan water. So I think that is why The Star Elders had us end up in Roatan for this trip (for those reading, after you are done, you might want to take a sea salt bath). The other thing that will be really important besides movement will be breathing deeply. Keep breathing! The threads that were connected to that beam of light going through us, they are evolving now. There are threads going out from your light cloth to everybody that you are connected to . . . all your family and friends . . . all your relations. They are connecting the ones that have an agreement to be a part of this. They will get this same download but in a lighter way, because they are out in the world right now. We are protected by the energy of this sacred site, so we can handle more energy. Your relations will be cleared just as gently and easily as you will be cleared here. They are taking a look at what they have done so far to see how all that looks. They are going around. Some of your dumpsters are already way behind you. So a quite a few of you have already moved way ahead. You were ready for this, and you just didn't know where to put the duality. So some of your garbage cans are way behind you already. They don't let me know who they are, which is nice because I don't want to know. But they have shown me that quite a few of you have already moved way forward into oneness. That doesn't mean that the rest of you are not amazing and wonderful. But we cannot go exactly at the same time, because it would be a mess. Someone has to keep things anchored here while others move forward. Some people need to build a bridge to go across, and some need to be waiting on the other side. So we cannot do it exactly at the same time. So there is no right or wrong. Just some are crossing over very much sooner. But in the grander scheme of things, all of this is happening right now anyway. So this cosmic sonic energy is going to keep working in your body to break away the memory of the separation and comparisons that have caused this dimension so much trouble. Even in this country, we see the Gringos and the Mayas and their separations. We are moving toward a place where things are understood by frequency; not by definition. Even our physical names separate us. In the next world, we won't have names. We will have a unique frequency. This is why when you cross over, at the very beginning stages, it is frightening, because you won't know who you are, but yet you will . . . which is kind of strange in itself. You will know who you are, but you won't know what that means anymore, because your definition and the history of your DNA, all the way back to your ancestors, will be gone. The only thing that will be left is the light. Now they are sealing up all that they have done in little iridescent bubbles. You can see through them, But this is going to protect you from the world for awhile as we walk through the rest of this trip and after we go home (and for you that are reading this). You are going to be in these little bubbles, so all of this clearing and downloading can incubate, and you can get really, really clear. Because all of us are going to have to still be in this world, yet the world is going through all of this anyway. So I am going to check now to make sure that all the little bubbles are up and running. These bubbles are going to go through all time, space, dimension, past, present, future, body, mind, spirit, 7 days a week, 24 hours a day, 365 days a year . . . until you decide that you no longer need them. Or if you don't like the way it feels, or anything they have done or said, you dump it in the garbage can which you have behind you. The Star Elders are not dictators; they are just the buddies. OK that looks good. The Star Elders are pretty clear that most who read this are probably bridge builders and that is why we are here at this time on Earth. So we need to be really clear to build a bridge, so when others go through this, they will have a clear path to follow. Right now we are heading into a place where there is no path at all. We are going where no man has gone before. And even the Masters that have taken us this far, with all their incredible wisdom, don't know what is on the other side of this age. The Star Elders don't know what is on the other side. They have ideas and clues, because they have teachings about what it might be like. But they don't have a physical reality or an experience about the shift and what is beyond. We are all doing this together including all the ascended Masters. The whole cosmos is going through this Shift. Now for some individual fine tuning . . . Some of you that are extra sensitive, they are putting a double bubble around you. Because when you go out in the world, you get lost really easy. Again, they don't let me know who those people are. I am grateful for that. I don't want to know. But there are some double bubbles here. So that is good. 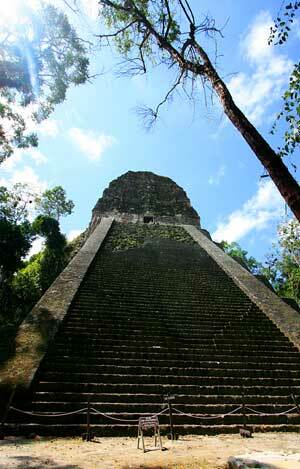 This is what the Star Elders wanted to do here in Tikal. Tikal is an intergalactic doorway. 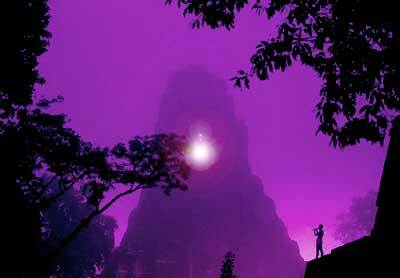 It is a place where people came to travel to other worlds. Palenque was the university, and you learned how to travel the dimensions. In Tikal, you actually did it. I think it is interesting because I just remembered this just now, and because we are in between worlds on Earth right now, what better place to anchor this than here in Tikal. Copan is entirely different. It is full of incredible power, and I think it is going to empower what we have started here. It is going to give us the juice to finish the job. But again . . . we don't know what will happen until we travel to Copan. The water is going to balance it all out. I don't plan this. I just arrange what I am called to do on a trip. I usually don't know what it means until I get here. I have learned to trust this process. This has been a very different group in vibration. We are traveling within the bridge between what was, and what will be. The Star Elders always say that it is the space in between where the best stuff happens. So we are in that in between spot. I feel that all of our groups, for that last 15 years, have been getting us to this point. Remember on the first day where we said that we are starting off where we usually end up, and I thought, "Oh my God, where are we going to go?" We have gone to the in between space. So they are going to ask you to try and stay focused, especially when we enter the stillness and the beauty of the jungle around us. One thing that survives on the other side is nature because it is emotionally neutral and is always in the present moment. You don't see birds creating savings accounts for the future. They do what they need in each moment. We hope this was valuable to you, and that the clearing and healing our group received while in TIKAL, was also gifted to you : ) This was our intent by sharing this message. Following ASAP… the message we received in COPAN!